A study led by Prof. Daesoo Kim of KAIST has overturned 30 years of consensus on the cause of Parkinson’s disease. The team showed that inhibitory basal ganglia inputs excite target neurons instead of suppressing them, leading to motor dysfunction in Parkinson’s disease. Parkinson’s disease is caused by insufficient levels of dopamine in the brain; its symptoms include rigid muscles, slowed movement, and trouble walking. There is currently no cure for the disease. Most treatments for Parkinson’s rely on motor signal suppression theory, proposed by Dr. Delong’s team in the 1980s. According to this theory, inhibitory basal ganglia inputs interfere with motor function by suppressing motor neurons. The basal ganglia secrete GABA in the thalamus; the amount of secretion increases under low levels of dopamine, which are a feature of Parkinson’s disease. However, this theory has limitations in explaining the disease’s complex symptoms. 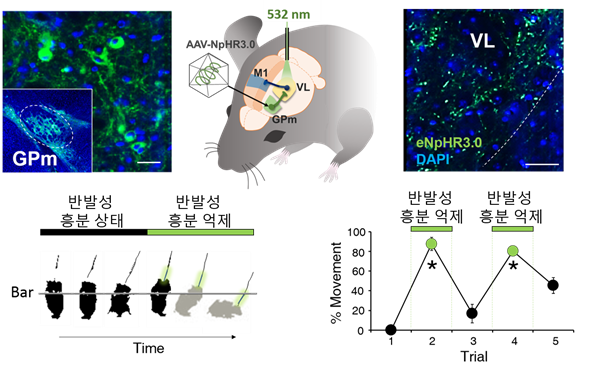 The team employed optogenetics to stimulate inhibitory basal ganglia inputs in mice, so as to induce symptoms similar to those of patients suffering from Parkinson’s disease. The ventrolateral thalamic neurons appeared to be temporarily suppressed, but were in fact engaged in rebound firing. The team found that mice suffering from Parkinson’s disease completely recovered when rebound firing was inhibited. They explained that inhibitory basal ganglia inputs induce excitatory motor signals instead of motor suppression. Funded by the Ministry of Science and ICT and the National Research Foundation of Korea, the study was published in the prestigious Neuron on August 30.